In an otherwise unassuming room on the third floor of Teel Hall, visitors are transported to new worlds without ever having to leave their seats. They can jump into Vincent van Gogh’s 1888 painting “The Night Café,” where they are bathed in the swirling color and light of the masterpiece. Or they can enter a dimly lit, aging elevator, where the tension mounts in tandem with the ascending lift. These scenarios and others are made possible by a single pair of goggles, a couple of computers, and seemingly endless topics of exploration. This is Albright’s virtual reality lab. For the last couple of years, Albright students have been using virtual reality (VR) to research various disorders – from epileptic seizures to color blindness to concussions – as well as how people respond to stressful situations, and the impact of certain therapeutic techniques, including art therapy. “It has been very effective in simulating stressful situations so that we can explore how people respond to fear and discomfort without actually having to put them in danger,” says associate professor of psychology Justin J. Couchman, Ph.D.
Renee Hunsberger ’19, a psychobiology major, spent the summer exploring the effect of self-efficacy – an individual’s belief in his/her capability – on physiological stress appraisal, or how one’s body automatically responds to stress (such as increased heart rate and perspiration). And she used that creepy virtual elevator ride to do it. Before her research participants donned the goggles and stepped inside the simulation, Hunsberger asked each to recall either a moment in their lives when they successfully overcame a difficult task (self-efficacy increase), or a time when they failed to do so (self-efficacy decrease). During the simulation, participants were wired to another computer to measure their physiological responses – pulse rate, blood oxygenation, and skin conductance levels – to various elements and stimuli in the elevator ride. Hunsberger hypothesized that the self-efficacy increase group would better cope physically with the stress of the experience because they recalled a scenario designed to boost their confidence levels before entering the simulation. “Looking at the effects of self-efficacy on stress appraisal, I hope to provide insight into easy and effective tools that would help college students better manage the everyday stress in their lives,” says Hunsberger, whose work was part of the Albright Creative Research Experience (ACRE) program. A number of psychology department faculty members have collaborated on the virtual reality lab. Assistant Professor Keith Feigenson, Ph.D., a neuroscientist, set up the physiological monitoring equipment, which is providing key insights into the connection between mind and body. Assistant Professor Bridget Hearon, Ph.D., a health psychologist, helped Hunsberger craft therapeutic practices to measure the personality traits of resilience and grit, which Hunsberger administered to her participants at the conclusion of the simulation. “This way we’re combining philosophy, perception, clinical psychology and biology in a way that gives students a broad understanding of how a particular process works,” says Couchman. Virtual reality offers a host of promising applications, says Couchman and his students, from studying how our minds construct reality, to using it as exposure therapy to help people overcome phobias, to increasing understanding and empathy for others living with disorders. To date, the VR lab has been used to simulate the effects of color blindness, while students interested in sports psychology and emergency medical care have also researched concussions by exposing participants to stressful or relaxing conditions to see how that impacted memory and other processes related to head injuries. As part of an ACRE project, recent Albright graduate Gwenievere Birster ’17 used VR to simulate the visual effects, including motion blur, associated with partial epileptic seizures. “Ultimately our goal was to develop a way to study epilepsy outside of a clinical population, and our results showed our manipulations did create a significant impairment. Our research would not have been possible without the use of virtual reality,” says Birster, who is now a clinical research assistant in the Anxiety and Stress Disorder Lab at McLean Hospital, an affiliate of Harvard Medical School. the-art research that, at many other universities, isn’t possible at an undergraduate level,” Birster adds. Last spring, Birster presented the findings of her VR research at the International Convention of Psychological Science in Vienna, Austria. She was joined by classmate and alumna Natalie Wilson ’17, who used the virtual Van Gogh painting to research the biological and psychological effects of exposure to art. “I was able to combine my passion for art with my psychology major to introduce a personable form of therapy where patients would not feel that they need to rely on medication to lower anxiety or enhance their mood,” says Wilson. The VR lab is not confined to psychology-based research. The technology can be used in a variety of fields, including architecture, medicine, video game design and business. “So students interested in almost any area can get hands-on experience with cutting-edge technology and ask questions they’re interested in answering,” says Couchman. 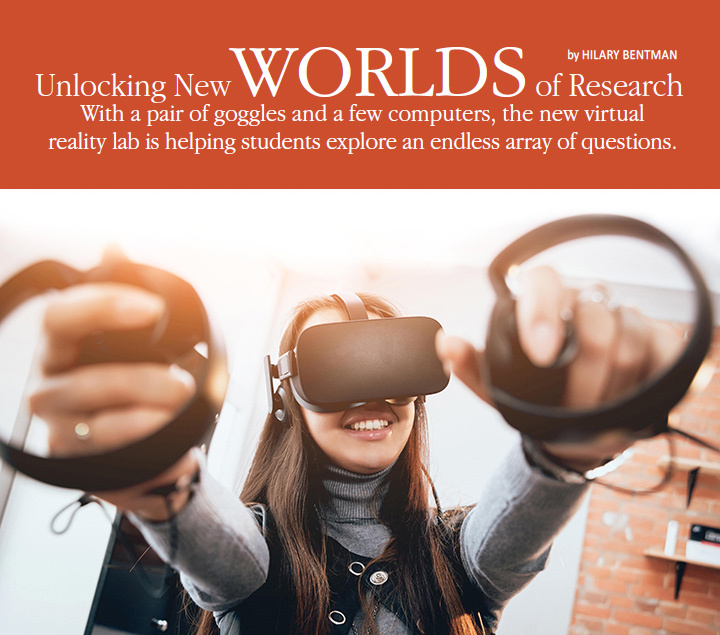 With a background in philosophy, Couchman also sees virtual reality as a way to explore bigger questions of illusion and reality, which helps students think critically and outside the box. Through virtual reality, he says, students realize that some of what they take for granted —what the color green actually looks like, for instance—may not be as simple or straight forward as first thought.